Office and Onsite Massage massage is great employee benefits ideas that contributes to your team’s good health, boosting team morale and loyalty and in turn improving productivity in your business. 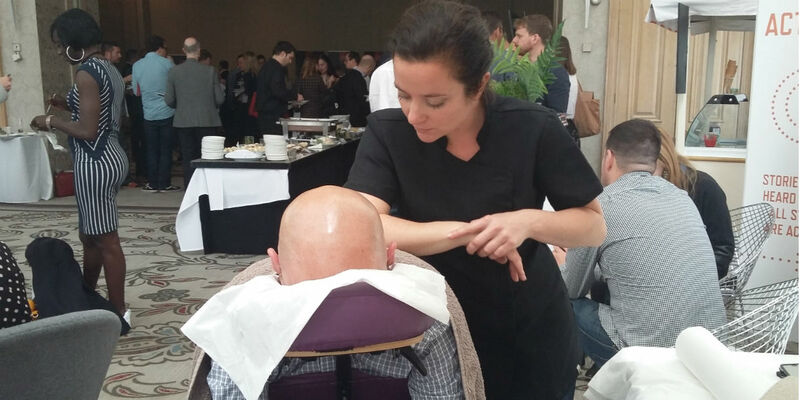 Team Pamper provides trained massage therapists to give office/onsite massage to your staff, conference delegates and clients. Our compact ergonomic massage chairs take minimal space but deliver maximum stress and muscle relieving massage. We at Team Pamper start our treatment sessions from a minimum of 10-12 minutes and upwards. Our treatment times allow our therapists to consult with each client, effectively warm up and administer their massage. We also give practical stretching tips and home advice after every massage and allow a hand over from client to client. We do not offer 5 minute massages as an option as we simply do think this is enough time for our therapists to effectively warm up and massage clients to our high standards. Organising a sporting event? Our team of remedial sports massage therapists are on hand to relieve, stretch and relax your competitors. Your therapist/s provide either a massage chair or massage table depending on your event and sport. Office and onsite massage available across London, Brighton and the South.